Some people can’t live without hot sauce, made from chili peppers and other ingredients. Spicy sauce lovers will put it on everything from eggs to sandwiches to steak. National Hot Sauce Day, on January 22, is an excellent opportunity to show your appreciation for your favorite hot sauce. They come in a variety of styles, usually based on regionally available ingredients. They’re also a staple in the culinary cultures of many countries throughout the world. The Super Bowl featured the now famous commercial of a man showering his pizza with Tabasco, getting bit by a mosquito, and smiling as the mosquito bursts into flames. As a sign of hot sauce popularity in the American market, the Campbell Soup Company bought Pace, a maker of Mexican-style sauce, for $1.1 billion. Salsa replaced ketchup as America's number one condiment. Old El Paso, which would become a major player in the U.S. hot sauce market, made its debut. Colonel Maunsell White, a local banker, grew the first recorded crop of tabasco chiles. Tour the international aisle of your local grocer and pick up a couple of different hot sauces from regions around the world. You might look for some recipes that call for hot sauces and cook with a couple of different brands. Making hot sauce isn't just for professionals. If there are some particular peppers or spices you like, try making your own at home. You can easily find various recipes. Invite your friends over to celebrate. Tell them to either make, or bring a bottle of their favorite sauce, while you provide hot sauce-friendly foods. Ingredients include Scotch bonnet peppers, mustard, salt, onions, water, vinegar, turmeric, and sugar. This features Caribbean red habanero peppers, vinegar, tomatoes, onions, spices, cilantro, and ascorbic acid (vitamin C) added for freshness. Get set for habanero peppers, vinegar, onion powder, garlic powder, and salt. Ghost peppers and habaneros with a mix of spices, vegetables, vinegar, and oil create this almost sweet, yet terrifyingly hot sauce. More than half of American households have some type of hot sauce in the kitchen. Whether it's breakfast, lunch, or dinner, hot sauce is a staple at the dining room table for millions. The common denominator? Chili peppers. National Hot Sauce Day is celebration of the many regional flavors available. Hot sauce ingredients are drawn from their unique regions. 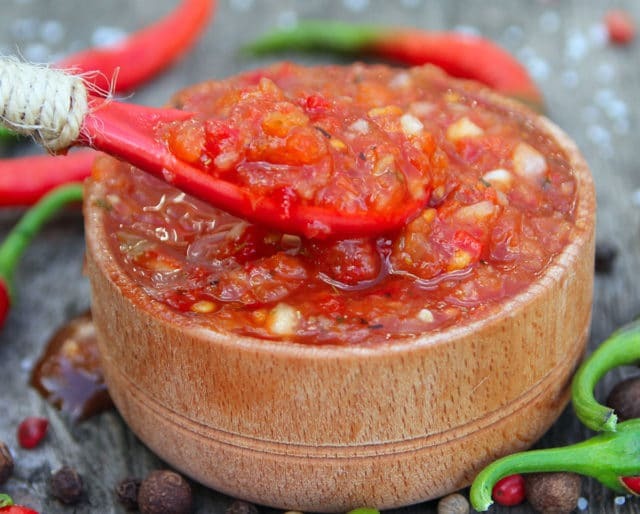 For instance, the Panamanian sauce called "Picante Chombo" includes locally grown Scotch bonnet peppers, and sauces from the West Indies feature local fruits and veggies.